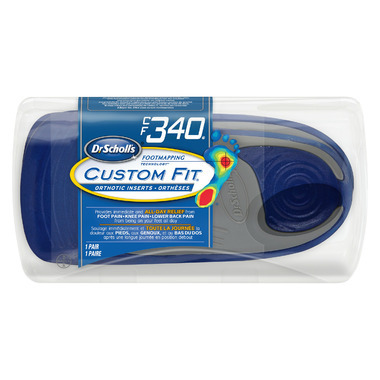 Need to replace your beloved Dr. Scholl's Custom Fit Orthotic Inserts? Well.ca has you covered! Dr. Scholl's collaborated with podiatrists to develop the Dr. Scholl's custom fit Orthotic Insert that is constructed with special cushioning and support layers, as well as a durable top cloth for exceptional comfort, shock absorption and long-lasting support. The unique CradleFlex Arch Support system provides immediate and all day comfort while the 3/4 length design fits easily in most shoes and stays securely in place. These are a wonderful and durable insole, my husband usually has an extra pair on hand so he never has to go without. He works in retail and is on concrete floors it helps with foot, knee and back pain.